The past few weeks have brought a swarm of additions to our household. Some were items, and some were living, breathing souls. It's definitely in sharp contrast from Samhain last year, where we lost a good deal of money and had a deep, scarring heartache from losing one of our beautiful cats, Nyx. Perhaps it's a sign of the year to come! 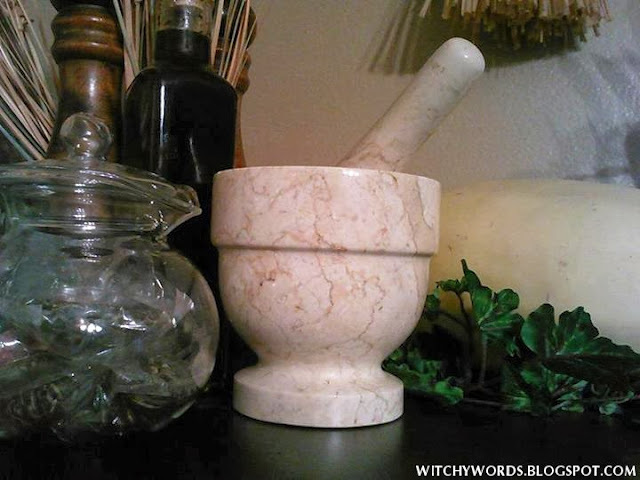 Let's start with the smaller things, like my new mortar and pestle! As you can tell, it now has a home on my kitchen altar. I didn't special order it or go out of my way to purchase it. I'm sure I've said more than once that I'm a bit of a thrift store addict. I go weekly just to walk around the stores. I don't always buy anything, once having a bit of a dry spell for over six months, but going weekly is how I run into things like this. It was $7, which is a bit pricey for thrift stores but an absolute steal for a marble mortar and pestle that has clearly never been used. It matches incredibly well with my soapstone crescent moon candle holder - the one that adorns my header and background. Ironically, I found them at the same thrift store, though years apart. Here's another thrift store investment I made recently. 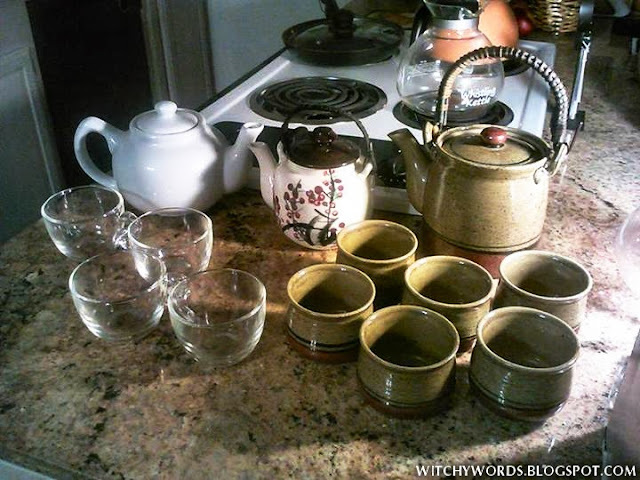 I've gotten into loose leaf teas and have been aching for a teapot aside from my glass one. I ran into all of these on one run a couple weeks ago. The teapot on the left runs for around $15 on Amazon. While it's not exactly an expensive teapot, can you believe that I managed to get all of the above for about the same money? But that's not the biggest addition to our household. Today marks the anniversary of our tortie cat Nyx's death. She's left a hole in my heart since her passing that I've been unable to fill. I wasn't particularly looking for a cat, but Apollo came to us - or rather he cried out for us. We'd noticed a mother nesting with three kittens in an empty apartment in our complex over the past few weeks. I'd even greeted the mother on our walk with Artie last night. I assumed someone let her out, or that the complex kicked her and the kittens out. She was super sweet, and I gave her some love, but she was still clearly feeding the kittens. She didn't seem cold, hungry or worried. Because of that, we left her be and continued our walk. This morning, we took Artie for a walk around 10:30 AM and passed by where I greeted the mother last night. After taking a few steps past the walkway, we heard a distressed meow. I immediately chased down the meow to find this little one - one of the mother's three kittens - trapped in mud under a walkway. The mother and other kittens were nowhere in sight, so I assume he was abandoned because she couldn't get him out of the mud. My husband and I dug him out, vetted him and brought him home. He's only six weeks old and a bit malnourished, but absolutely sweet. He's also healthy and good to mix with our boys in a few weeks. He and Zeus chatted quite a bit while he was in the crate and Artie wagged his tail at him. Hermes was the only that seemed frustrated about the new fuzzball. He's spent most of the night pouting like he's being replaced, which is obviously not the case. Zeus was named because we found him during a lightning storm. Hermes was named because we found him in the mail room. Artemis was named because he was an excitable, bright bouncing ball of white in Nyx's territory. And our beloved Nyx was named because we found her at night. Because we found this kitten on a bright, sunny day, we decided to name him Apollo. It also gives him a special connection to our other cats as Apollo was Artemis's twin, Hermes's half-brother and the son of Zeus. Finally, because Apollo was the god of light and sun, it makes him the striking opposite of Nyx, the primordial goddess of the night. In a way, it gives him a special connection to our departed tortie cat. We played with a few other names in the process, including Hades and Erebus due to the timing. Unfortunately, Hades sounds too much like Hermes and the two might get their names confused. Erebus was a name I threw around when we were naming Zeus, but we decided to avoid it at the time because nicknames were difficult (Erie? Bussy?). After that, Erebus became "the name we almost named Zeus," and I couldn't imagine using it for another cat. Another name we looked at was Nox, the Latin translation of Nyx. Naming the new kitten the same name and just one letter off from our late cat seemed disrespectful and put a negative tone on his name. Apollo was a name suggested by a friend and it seemed to fit well given the circumstances. Thus we welcome Apollo to our new family! Familiar? Friend? Pet? Only time will tell. Question for my readers: What new changes have occurred in your life since Samhain just a few days ago? Aww, how sweet! He's adorable, congratulations. Thank you! I'm from Missouri, but managed to avoid my parents' deep-south accent and writing patterns. Not sure how that one happened! Hi, oh, I am sooo happy for you, And that little fur baby is sooo lucky to have found such a home as yours. I was wondering if you might not mind giving me a wee bit of advice? I read over your book recc's post and thank you so much for that! I was wondering if you were to suggest the very first place one should go or first book to read to start learning after deciding this is the path for them. I seen you put wicca for the solitary as a beginner book ,Would you suggest about.com instead ,What was the first book or place you went to start learnng? Thank you for your help. If you're new to Wicca and you can purchase a book, I'd heavily suggest Cunningham's Wicca: A Guide for the Solitary Practitioner. However, if you're unable to purchase a book at this time, About.com is surprisingly helpful. When I was starting out, About.com didn't have a Wiccan and Pagan section (in fact, if memory serves me right, it was barely a blip on the internet radar and kept having its article count drastically reduced). That being said, I really wish they would have. I learned from little, independent sites growing up - something that I wouldn't recommend as I wasn't always sure what was true and what wasn't. Then again, I'm a little, independent site! A lot of people start with Uncle Bucky's Big Blue Book. My first book purchase was this book, actually. As one of the first US practitioners, he could give you a direct look at the foundation of US Wicca. Be warned that Buckland's book is heavy on Buckland's beliefs. I don't personally always agree with him, but honestly, I don't 100% agree with any writer. Not agreeing is how you develop your own beliefs, and that's okay! Also on my list is Gleewood's Seeking: First Steps and Tools, as well as The White Goddess's Pagan Portal. I found both resources great for basic Wicca and Pagan 101. I hope that helps! Good luck on your journey! Thank you so much for your help! 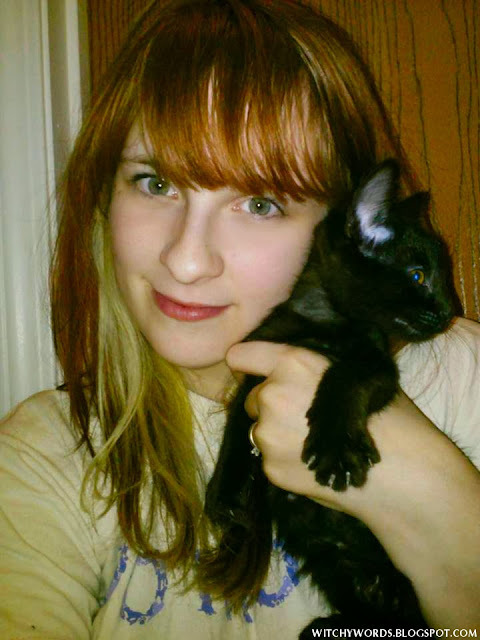 I will start checking those out today, I am so glad you were able to save that little kitten, My friend volunteers at a shelter as well and the all black kitties never get adopted because of superstition. I know, I could not believe it either. So I am so thrilled for little apollo and you. Would you mind explaining what a kitchen altar is? Or what yours is? thank you so much! I have recently become obsessed with cooking and baking and i am definitely creating one! What a wonderful concept. I really love your blog. You're very welcome! Thank you so much for reading!